Uses : The leaves when dried may be used as a seasoning. For some time people have used it as a flavorful herbal tea for medical benefits such as a remedy for the colds, respiratory inflammations, or stomach problems. Tagetes is used for digestive tract problems including poor appetite, gas, stomach pain, colic, intestinal worms, and dysentery. It is also used for coughs, colds, mumps, fluid retention, and sore eyes; and causing sweating. 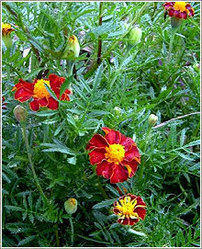 Women use tagetes to start menstruation, treat sore breasts (mastitis), and protect against miscarriage. People sometimes apply the leaves directly to the skin for treating sores and ulcers. The juice of the leaves is put on the skin for treating eczema. Its oil is put on the skin for treating wound maggots. It can be used to produce an organic dye.